Many customers have multiple displays playing same contents at a location. For eg. one of our customer is using piSignage network in railway stations, Displaying train arrival/departure information & inserting Ads in between. And They needs all their Displays in Sinc. Some customers prefer to power off the players at the end of the day and power on the players the next day when required (A better alternative is TV_OFF feature). When you manually power on players , there is an inevitable **time gap **between powering on each player. Each player starts running the Scheduled playlist immediately, the moment player is powered on. This delay means the displays wont be in sync. 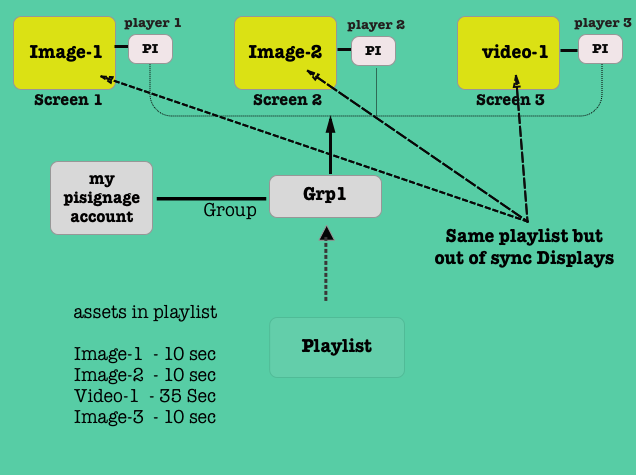 The playlist contents and scheduling settings are stored locally in the player, making sure the player runs irrespective of network connection. For some it is a non issue as, all they need is the right content to be displayed. Others need all the displays to be synchronized, creating a cool network of displays in sync. The solution is simple . Schedule the required playlist to be deployed at a specific time. Make sure all the players are powered on before the scheduled time. So if you have scheduled the playlist to be deployed at 8AM in the morning, make sure all the players are Powered on by then. 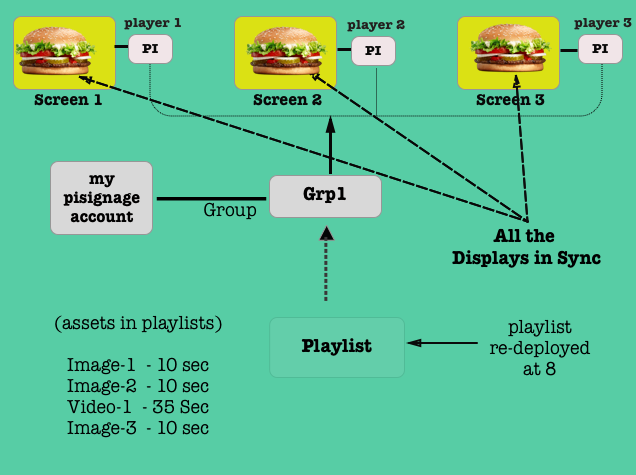 When the playlist is deployed at 08:00, it will be deployed in all the players of that group at the exact second, thus all displays start running the playlists with contents in sync. Basically what happens is when you poweroff the players at the end of the business day and poweron next day, the scheduled playlist (or the default playlist if nothing scheduled) will start playing but will be out of sync. At sharp 08:00 the playlist is deployed and the displays start running in sync again. TV_OFF feature to turn Off screens centrally without having to manually turn off each player.